Yes, I know, I know. I said . . . . . . more of this blog, more getting ready for Christmas Day like I used to earlier. But this business has taken over like I never expected. Never to fear, I am listening to Christmas music today. I will force myself to do something today for Christmas, even if it means at least DREAMING of a cooler Christmas. 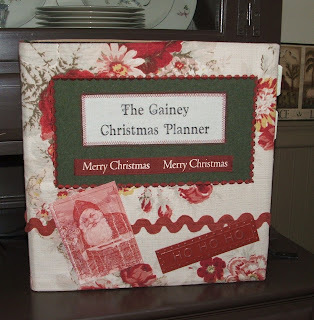 I am going to get out THE Christmas notebook and purge some pictures, update the Christmas card list and make a new calendar. I sure hope you are being more productive than I have been lately. With only 5 months left, I HAVE TO GET ON THE BALL. A new "Did You See?" . . . . .
That it has been since last October that I posted on here!? OMG .... Knowing today was Rudy Day, I thought I would pop over here and check my stats. I had 11 visitors today alone and some 250 last month. Apparently some people are the eternal optimist and are hoping I will have anything to say here. So not to let you down, here I am! I haven't really done an official "Rudy Day" except on Christmas Day this past year LOL. My business has done much better than any of us anticipated. But with that comes a LOT of work. I didn't send out cards last year or gifts to some special friends that I usually do. This year I decided to make some special gifts anyway. I have started the first one. It's made of wool, of course! I want to add some red berries and then finish it off somehow. If you are one of my special friends, DON"T LOOK! Like you would know that ....... LOL Dear Hubby is off work today through Monday so we thought we would work in the much neglected yard this morning. After a little business paperwork, I think I will cut out the parts for a few more of these little cuties and do the handwork tonight. BIG News for this Christmas ...... I am going to be a grandma! You may have seen my big announcement on one of my other blogs but I didn't mention on those that the baby is due on December 21st. We have experience with Christmas babies ..... my sister-in-law was born on Christmas day. Hope some of you missed me 'cause I sure missed you. Maybe some day I will be able to fit 24 WAKING hours in one day! Did you see? . . . . . So to recap, the last Christmas crafting party didn't go as well as the first. It was supposed to start at 10:00 but no one showed up until 12:30. Then I spent a good bit of time "catering" to the daughters and a guest . . . . .you, know . . . . hey, mom, do you have an extra pair of scissors? - put my stuff down, go find the scissors, get back in the chair, pick up my handwork, . . . . hey, Cathi, I forgot my ecru floss, do you have any? - put my stuff down, go upstairs to get my floss stash, get back in the chair, pick up my handwork . . . . hey, mom, can I borrow your Ott light? mine is in the car . . . . . repeat, repeat, repeat. Last month I was out of town for Rudy day at a quilt show. Today I am home and getting ready for another show BUT I am sneaking in some Rudy anyway. I HAVE to. We are running out of time, people! So what are these pictures on today's post? Just random things I happen to have that are Christmas-y on this laptop. My PC has all but shown the blue screen of death so I am working from my laptop for now. Hoping Computer Geek can come over and get it up and running enough to back up one more time before we send it to the computer graveyard. I did some backups last week but not of the emails, and contact lists. Maybe I need to ask for a new computer from Santa! Have a happy and productive Rudy Day! Another Christmas Crafting Party . . . . . I'll be hosting another Christmas Crafting Party tomorrow with the same people as before, my two daughters, myself and my friend Jennie. I almost had another one coming but she doesn't retire (for the second time) until September 30th. This time I will remember to get the Christmas mugs out of the attic before it gets too hot! Come back tomorrow and visit! Happy Rudy Day . . . . . I had plans for today that didn't include Rudy Day. But that doesn't mean I forgot about it! I went antique shopping with a friend for a few hours in Chester, South Carolina. She had been to an antique shop there in the former Hall Lumber Company building on Hudson St. (for those that want to go) and thought I might like it. Boy, did I! Besides some other non-Christmas items, I found these . . . . . I found this tablecloth for only $3.00. I'm sure it isn't an antique but it is pretty. It has a few stains on it. I am thinking of giving it a good tea dye bath and then making it into a tree skirt since I don't have a round table and it is round. Hey, for three bucks . . . . . I also found these two for only $2.00 each. The pink ornament is only about 2" in diameter and the turquoise about 3-1/2" long. Maybe not old but the perfect aged patina. Off to the grocery store because we are out of food. Not because I enjoy going out in the heat in the afternoon with all the screaming elementary kids that just got out of school (we started back already). 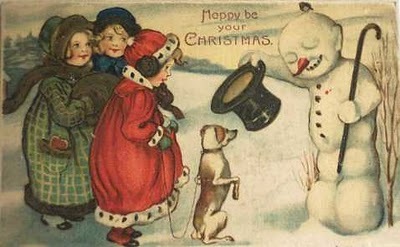 When I get back I will check out the other blogs, the forum and try to do something Christmas-y before the day is out. There's still a week left . . . . There is still a week left if you want to throw together your own Christmas in July party. Just call a few friends, grab a Christmas project (either a decoration or a gift), add a few Christmas DVD's and you're all set! I told some peeps that I would be back with another post last night. Oops! I finished what I had planned but not until midnight. I finished all the embroidery around the "Let it Snow" quilt. Now just the quilting, buttons, snaps and binding. and I finished the tote bag I made for The Married One. The handles are wide webbing attached with some older pink buttons. She loved it! The Married One packed up before I had a chance to take a picture of her pillow tops. She still has to do the machine work. She doesn't procrastinate as much as I do so maybe a finished picture soon. The Wild One started on a Prairie Schooler Santa that she (meaning me) will make into an ornament. I think she is going to make 4 of them. No, she didn't get far but most of it was prep work ..... counting, fray check, finding the right colors. Now that she has started, she should just whip right through these - I hope. 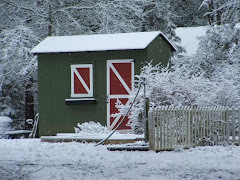 It's too hot out to do anything else, so why not stay inside and dream of a White Christmas or at least a cooler one!